The civil litigation in the $194 million Trevor Cook Ponzi and Forex caper has taken a strange turn. Former radio host Pat Kiley, a Cook co-defendant in civil cases brought by the SEC and CFTC, has filed a pro se pleading asking Chief U.S. District Judge Michael J. Davis to order David Slovick, an attorney for the CFTC, to pay Kiley $1,000 for making Kiley respond to an “offensive” government motion to strike his answer to the CFTC’s complaint. But the government, according to Kiley, is trying “to ‘get Pat Kiley’ at all costs.” Kiley was sued in 2009 by both the SEC and the CFTC. Kiley contends Slovick filed an “un-researched and frivolous pleading” filled with “wild and silly allegations” that Kiley was manipulating the legal system. Davis should impose a penalty of $1,000 against Slovick and arrange for the money “to be paid to Pat Kiley,” Kiley advised the judge. And the agency further claimed that Kiley was not really a pro se litigant — and thus should be held to a higher pleading standard — because a professional attorney was helping Kiley and not signing the pleadings. Attorney H. Nasif Mahmoud of Illinois and Gary, Ind., is assisting Kiley, the CFTC said. Mahmoud has not filed a required appearance notice on Kiley’s behalf, according to the CFTC. In court filings, the CFTC quoted a May 10 email from Mahmoud to the agency. “What I do in my private time to assist an innocent man whom you have falsely accused of wrong doing is my business,” the email read in part. 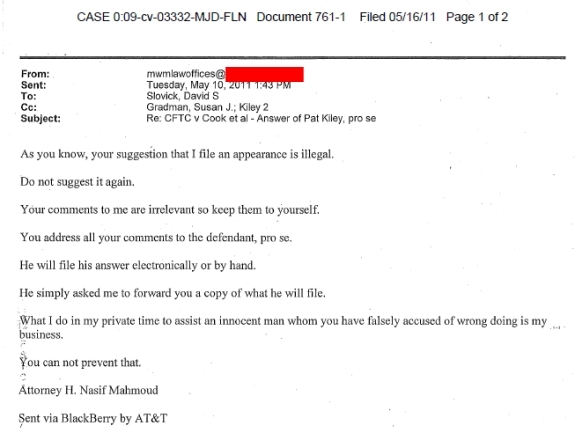 The CFTC engaged in “illegal” conduct when it suggested Mahmoud was acquired to file an appearance notice, according to the email. OMG, this is even better than the “tools” in the ASD case. Poor Pat, being picked on by the big bad evil government. Say, maybe Pat was in ASD too, and we just don’t know it. Seems to have the mantra down pretty good that the ASDers use. Wonder if Pat is also using Curtis Richmond as his pro se instructor? I used to work with Pat Kiley at a finance company named Timmerman Leasing. Pat was unsophisticated, unorganized, witless, aimless, and a total joke as a salesman. I used to hear his radio show, and was amazed that he had picked up such a “pitch” for financial tools and arbitrage that he was intellectually incomprehensibly unable to grasp, so I suggest he was coached, and picked up the vernacular through his cronies. He is basically a dumb as a box of rocks. In the office, he was a beggar, a thief, and a liar. He did not seem in good health even then, I hope he is reaping what he has sown.